THE FLOORING, CABINETS, COUNTERS & DRAPERY ARE ALL EASY CLEAN AND MAINTENANCE PROOF. FX DESIGN CREATED TWO DIFFERENT VISUAL ENVIRONMENTS. "Working with Laura was very easy. 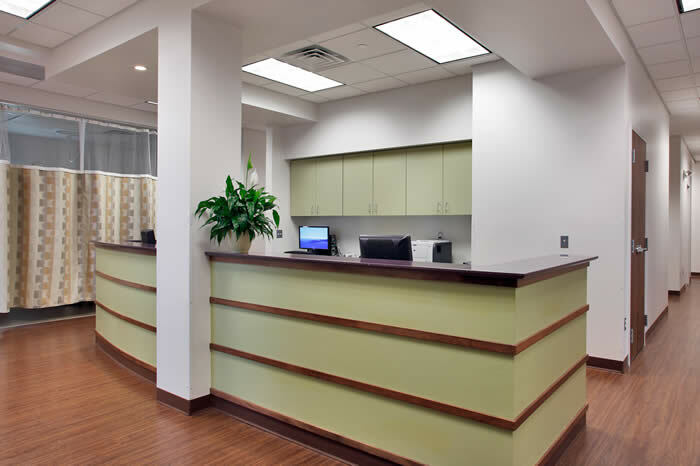 She was receptive to our requests and was able to easily blend 2 different tastes and come up with a design that would ultimately be pleasing to our patients. The product she offers is highly professional and cost effective, not to mention very timely. 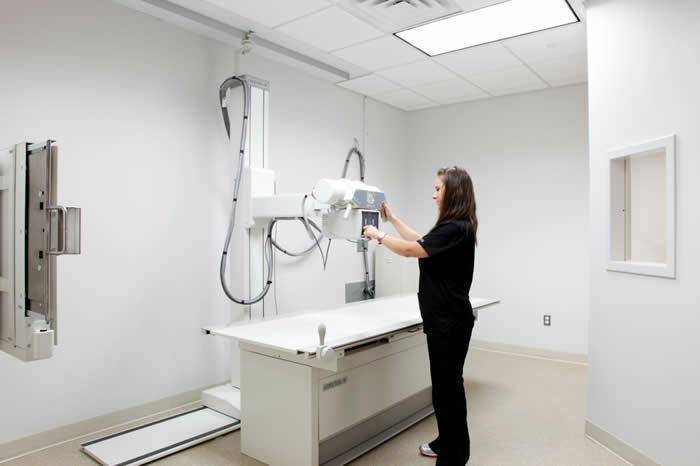 We recommend her to any healthcare facility with confidence." COMBINES TWO DISTINCT COLOR PALLETS THAT THE DOCTOR'S SELECTED. 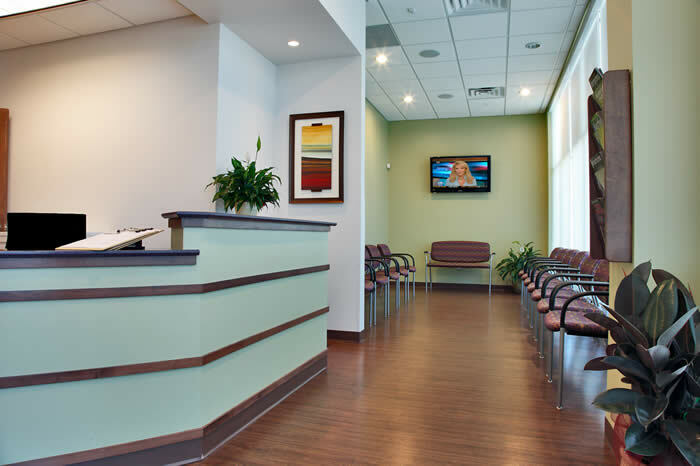 FX MEDICAL DESIGN DEVELOPED A WARM INVITING, YET MODERN PATIENT CHECK-IN AND WAITING AREA WITHIN STRICT BUDGET & TIMEFRAME. "Working with Laura was very easy. 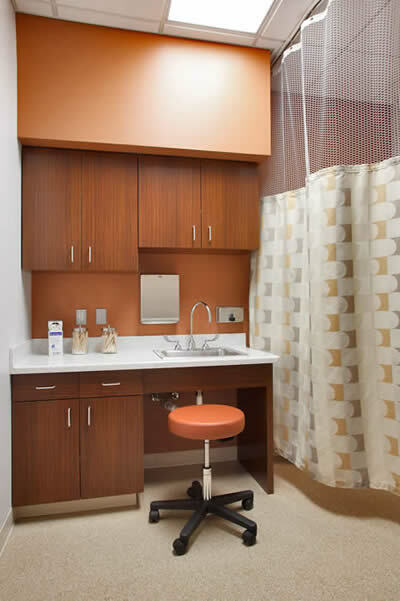 come up with a design that would ultimately be pleasing to our patients. The product she offers is highly professional and cost effective, not to mention very timely. 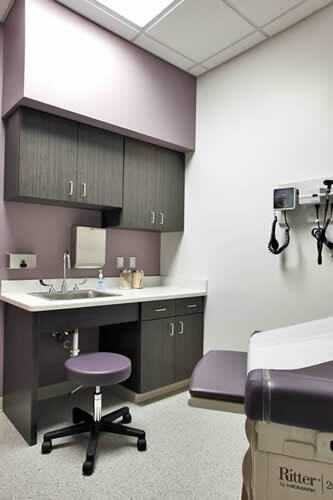 We recommend her to any healthcare facility with confidence." 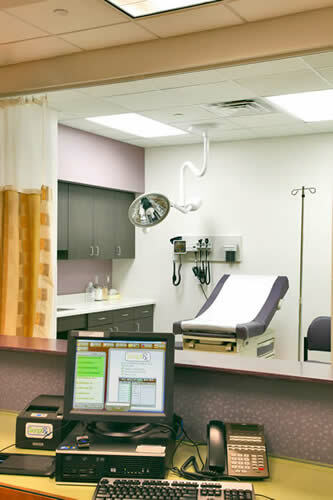 THE NURSE'S STATION HAS A CLEAR VIEW INTO THE AUBERGINE TRIAGE ROOM. THAT OFTEN APPEALS TO FEMALES. 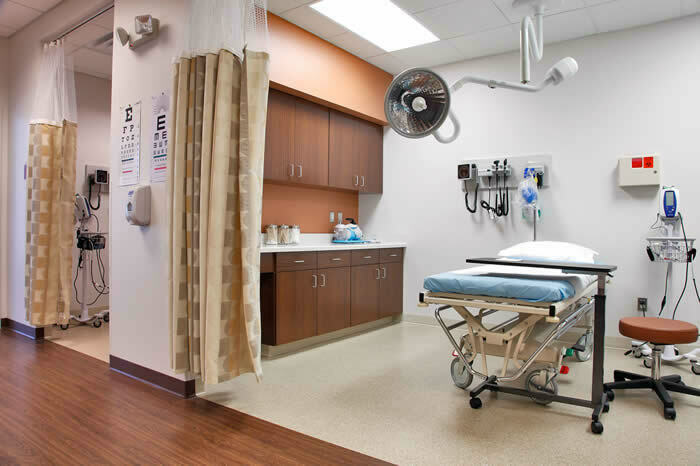 CLINICAL WHITE WAS REQUIRED BY THE DOCTORS FOR THIS ROOM.